With more than a third of the season complete, the Tigers find themselves caught in a whirlpool that is rapidly sucking them into an abyss. If they remain considerably behind in the American League Central race in mid-July, should they be buyers or sellers at the trade deadline? They do have two excellent pieces of trade bait to replenish a farm system that has been depleted by trading prospects for veteran players down through the years, and getting higher, low-round draft picks because of free agent signings. Jhonny Peralta and Delmon Young are on the final year of their contracts. Both are eligible for free agency after this season. They would be the consummate rent a players for the stretch run and the postseason for contending teams. In fact, that's how the Tigers actually acquired them both, a year apart. The Tigers' troubles become more alarming by the day. I thought a couple weeks ago it was a given they would snap out of it. It remains viable, but I'm not so sure at this point. A lot of it is due to injuries. Alex Avila and Austin Jackson, the Tigers' two best defensive players, who man premium positions defensively (catcher, center field), are on the disabled list. Their No.2 starter Doug Fister is on the DL for a second time. He doesn't have a victory this season. 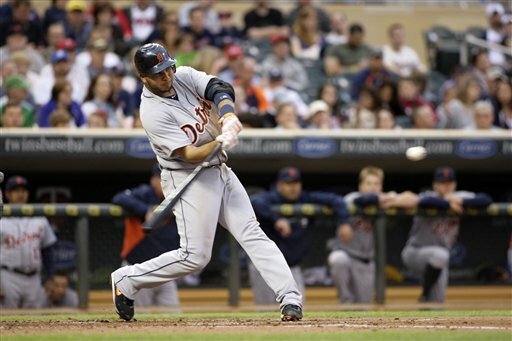 Outfielder Andy Dirks was playing well for the Tigers. He is on the DL, too. When will these players return? If so, how effective will they be after extended time out? Also, how will the Tigers do record-wise in the meantime? It's one thing to tread water - and then strike. It's another to merely drown. The Tigers are drowning lately. A lot of it is due to just bad baseball. The Tigers and the basic fundamentals don't get along. The list of issues in this regard is endless, but it reached a showing at The Theater of the Absurd Tuesday during a 5-1 loss to Cleveland. Tiger hitters kept getting ahead 2-0 in the count against the notoriously wild Cleveland starter Ubaldo Jimenez - and getting themselves out anyway. The injury to Avila is particularly hurtful because backup catcher Gerald Laird has a similar injury and is iffy, and the Tigers' top trading piece at the deadline among prospects - maybe their only really good one - is Double-A catcher Rob Brantly. He is not ready for the major leagues, despite.311 batting average, three home runs, 24 RBI and.820 OPS numbers at Erie. A catcher, James McCann, was the Tigers' first pick in the draft in 2011, and is doing reasonably well at high-A Lakeland, making Brantly a trade possibility if the Tigers are buyers at deadline. But the Tigers may need Brantly to catch in the major leagues soon. Trading prized prospect Nick Castellanos would not seem smart, either, unless it insured something special, not a long shot bid. Are you serious Pat? We would be lucky to get a bag of baseballs for Young and Peralta. You do realize Minnesota gave us Young for practically nothing last year, right? Pat, you may get a top prospect that playing A Ball at best. You may want to keep JP for next year because there is nothing in AA and AAA or free agency unless Drew gets his walking papers due to his ankle injury. He is a S Boros' client. As you've mentioned before Pat, the AL Central is not a strong division, and for that reason alone, I don't see the Tigers being sellers. Once again, a hot streak in September could win this division. They'll wave the white flag only if multiple key players are lost for the season, or another Central team creates major separation. They do have some interesting decisions to make on Peralta and Valverde. Both can leave and the Tigers have ready replacements for neither. the discussion. Usually it's caused by the fire communicated in the post I browsed. And on this post "The stark, but real, possibility of the Detroit Tigers as sellers at the trade deadline". I was actually excited enough to post a comment :-) I do have 2 questions for you if you usually do not mind. Is it just me or do a few of these comments look like written by brain dead individuals? :-P And, if you are posting on additional online sites, I would like to follow everything fresh you have to post. Could you make a list every one of all your communal pages like your twitter feed, Facebook page or linkedin profile?